How Do Smart Shoppers Shop? They shop with a sturdy basket, that’s what they do, especially if they’re so smart that they shop farmers markets for fresh produce. 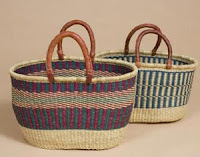 Remember: Farmers rarely package or wrap their products, so baskets like these Fair Trade Market Baskets and Handle Baskets work best. Why? The flat bottom spreads the impact across the bottom of the basket so you can carry more local eggplants per square inch in it. Also? Sturdy handles. You could put big, fat muskmelons in that basket and it wouldn’t break on you. 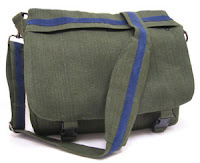 Speaking of pretty faces, I once dated a woman in college who stole a bag like this one from me. All right. One last bag for you, and, also, a bit of travel advice: When abroad, always have your passport in a cool carrier like this one. Not only does it keep a vital document neat and accessible, but it also distracts the person who’s checking it. While they should be examining your bags for the expensive goods that you somehow “forgot” to declare, instead, they’ll be thoroughly enticed by your passport bag, thinking to themselves, “Wow. Is that button made of real bone?” Want to go one step further? Combine the Crane passport carrier with the Crane jacket and you'll be a symphony of distractability.